Endowed with wholly original, melodious and extremely rich voice, Kalapini is widely recognized as one of the finest and well - trained classical vocalists of the younger generation.She is the daughter and disciple of legendary Pandit Kumar Gandharva and has also been trained by her illustrious mother, Vidushi Vasundhara Komkali. Kalapini learnt from her distinguished parents not only the technique and grammer of her art but also inherited a capacity for creativity and reflection. While strengthening her hold over her inheritance with fine sense of understanding, she has evolved her own vision and has emerged in last decade as a vocalist with a profound degree of sensitivity and intensity. Her performances are marked by youthful imagination, artistic thoughtfulness and a mature command over various aspects of classical vocalism.Her musical lineage is most manifest in the emphasis laid on the rendition of the bandish (composition), its bhava or meaning, and in the studied restraint which does not allow the notes, or laya (tempo), to overwhelm the lyrics. The full melodic range and versatility of the voice provides a silhouette but they never are allowed to dominate the rendition by naturally sliding into vocal acrobatics. Her range of swaras has ability to convey various bhavas (emotions). The improvisations made by her are generally rooted in Gwalior gayaki, but carry her own distinct identity.Kalapini's wide repertoire of ragas and compositions is further supplemented by the presentation of the traditional songs of Malwa representing the folkore and ethnic scent of the region. The Sagun-Nirgun bhajans (devotional songs) of the various saint poets rendered in her inimitable style provide the acetic flavor to Kalapini's music.Committed to the promotion of art, she organizes music festivals at Dewas to bring together major scholars, performers as well as young artists. Performer of uncommon perception, Kalapini is popular amongst the youth for her lecture- demonstrations of Indian Classical Music. Kalapini lives in Dewas, Central India. 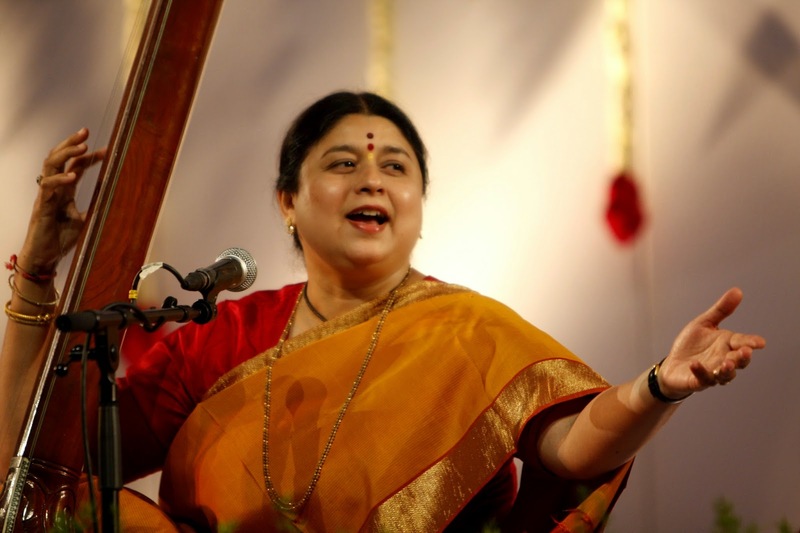 She is an active trustee of Kumar Gandharva Sangeet Academy.She has received a fellowship from Dept. of Culture, Government of India and has been honoured with the Kumar Gandharva Award by the prestigious Pujari Pratishthan of Pune.Commercial releases of her studio recordings include, 'Aarambha' and 'Inheritence', released by HMV; and 'Dharohar' released by Times Music. 'Swar- Manjari', a live concert recording, was released recently by Virgin Records. Kalapini has also recorded for sound tracks of films, 'Paheli' and 'Devi Ahilya'.